You know Fruit Stripe gum? It is that chewing gum (not bubblegum, you can't really blow bubbles with it) with a colorful zebra as its mascot. Yeah, I love Fruit Stripe gum, but I've noticed there are many who seem to like to mock it or otherwise insult the brand. Some say the flavor fades too fast, others think the included tattoos on the gum-wrapper don't imprint on the skin well, and a number of folk just don't care for the five various flavors. Well, I say forget those haters, Fruit Stripe gum is awesome. Perhaps the flavor doesn't last forever, but I savor it while it is there, and at least it doesn't wear out its welcome (some gums don't so much keep their flavor as have it just stay and insist upon itself). The tattoos aren't perfect, but if you put some effort in (e.g. 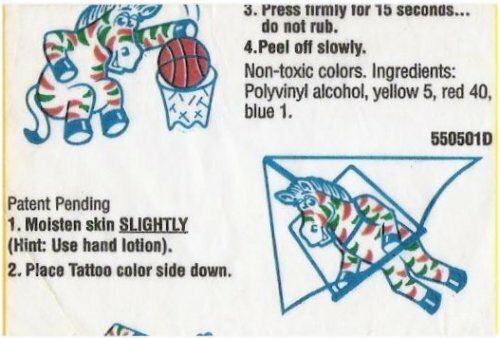 you don't just lick your hand and press it on as opposed to using a warm and wet washcloth like with other temporary tattoos) they work pretty well. 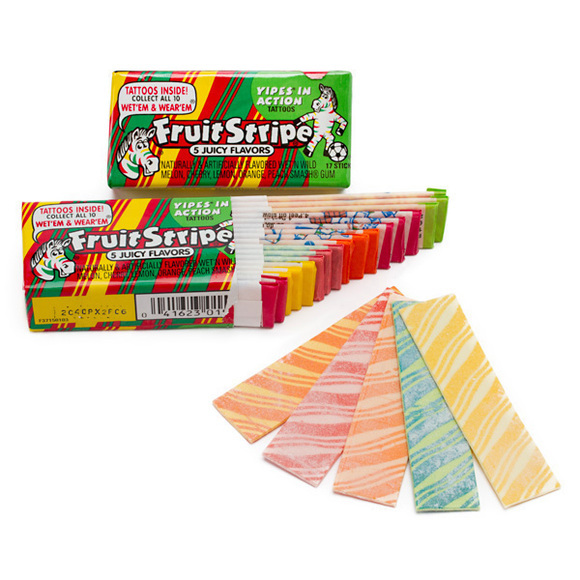 I'm not claiming Fruit Stripe gum is the best thing ever, but I know I'd pick it over Bubble Tape and its creepy gum-powder any day. I love the laid-back vibe Fruit Stripe gum has, with its Zebra who enjoys various fun recreational activities. He's not trying too hard to come-off as extreme or edgy like some mascots (Chester Cheetah), instead just having fun and giving us the pleasure of pasting his tattoos on our skin after we're done enjoying chewing our favorite flavor (I like cherry). I love Fruit Stripe gum regardless of how some folk make fun of it, and imagine it has many other fans who simply don't feel like arguing with the haters about why Fruit Stripe gum is awesome--we're just too busy enjoying it to bother debating you. Oh, and yes, the urban legend is true that the wrappers are safe to eat in that they are non-toxic (not a metallic wrapper), but you aren't really supposed to do so with them or any wrapper.. Note: Fruit Stripe gum did not pay me for this article or is even aware I exist, I just felt like rambling about chewing gum today. That said, I will email them about my article and see if they'd be willing to mail a lover of their gum some free packs--can't hurt to ask, right?